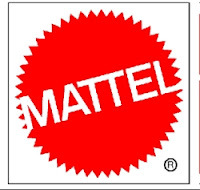 Mattel Inc. issued its second major recall in less than a month today, recalling about 9.6 million toys within the U.S. that were manufactured in China due to lead paint and loose magnet hazards, according to the U.S. Consumer Product Safety Commission (CPSC). Mattel also launched a national advertising campaign today, assuring consumers it is on top of product safety amid reports of an impending second big recall of its Chinese-made toys. 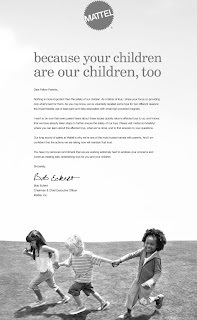 The full-page ad, which appears in Tuesday's Wall Street Journal, New York Times and USA Today, includes a letter from Mattel Chief Executive Bob Eckert, set above three playing children. The CPSC said the recall impacted a number of product lines including various "Polly Pocket" dolls, a "Barbie Doll and Tanner" magnet, Batman & One Piece action figure sets and a die-cast car from the Pixar movie "Cars." Coupled with news of the death of Zhang Shuhong, the head of Lee Der Industrial Co., the company that manufactured lead-tainted Sesame Street toys at the center of a massive U.S. recall, hung himself over the weekend and the fact that recalled products have been on the market as far back as May 2003, this doesn't look good for China or US biz.